Housing inventory measures how many months it would take to sell all the houses currently listed for sale, at the current pace of home sales. For example, if there are 400 homes currently listed for sale, and an average of 100 homes are selling each month, there would be a 4-month housing supply. This is because it would take 4-months to sell all the homes currently listed for sale. 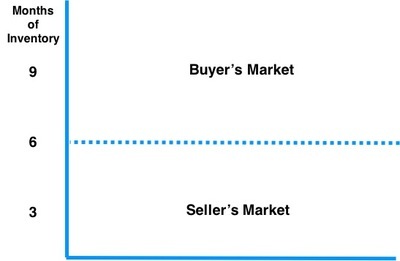 A buyer’s market is anything more than 6 months. If the inventory numbers are a little higher than 6 months, buyers have a little more negotiating power than sellers. But if the inventory numbers are a lot higher than 6 months, buyers have a lot more negotiating power than sellers. In this case, home prices are very likely to move lower, and sellers will most likely accept an offer for less than the listing price. A seller’s market is anything less than 6 months. If the inventory numbers are a little less than 6 months, buyers have a little more negotiating power than sellers. But if the inventory numbers are a lot lower than 6 months, sellers have a lot more negotiating power than buyers. Home prices are very likely to move higher, and buyers will most likely be competing with multiple offers (in some cases, dozens of offers), on the house they want. Contact me for more info on the latest housing inventory stats in other markets!